The month of December is usually an exciting time to go to your mailbox. Amidst all of the bills and junk mail, there are a slew of holiday cards from family and friends. Usually the best ones received are photo cards! Though it seems early to start thinking about Christmas and winter holidays, with a little advanced planning you can save big on your annual photo greeting cards. Holiday Cards by Boatman Geller are currently 60% off* at More Than Paper, and we have 4 great tips for taking the perfect holiday photo for your cards! 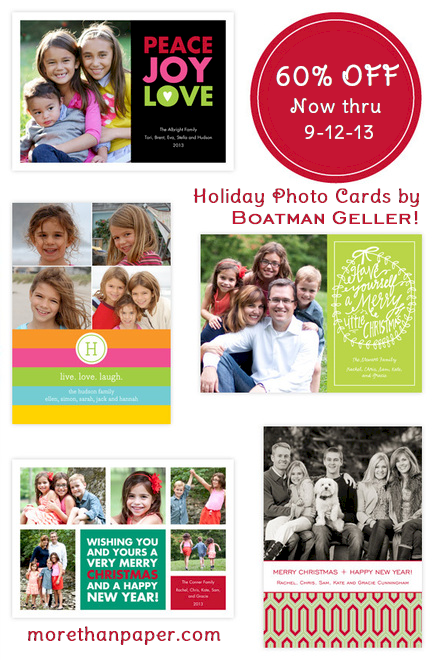 Shop all of the Boatman Geller holiday card designs here! Choose an interesting location like a park, the beach, riverfront or garden. The background shouldn’t dominate the picture. No beach? Set up a station in your house and take photos against a shower curtain, soft linen, or hang a roll of kraft paper. Consider your garage or side of your house as a backdrop if it’s wooden or has interesting architectural detail. Think about a clothing “scheme.” Clothes do not have to match but consider coordinating colors. Generally patterns do not photograph well, so keep attire limited to solids when possible. Use a tripod and camera with a self timer, or enlist the help of a neighbor or friend. If you don’t have a tripod, you can stack books on a chair or step stool. Take a few practice shots then assemble the group. Compose the picture. Think about arranging people from tallest to shortest, or placing the tallest people on the outside and the shortest in the middle (or vice versa). A popular composition includes placing the mother and father in the middle, and the kids around the parents. Be sure to “lean in” to each other to avoid gaps between people. The closer the better! 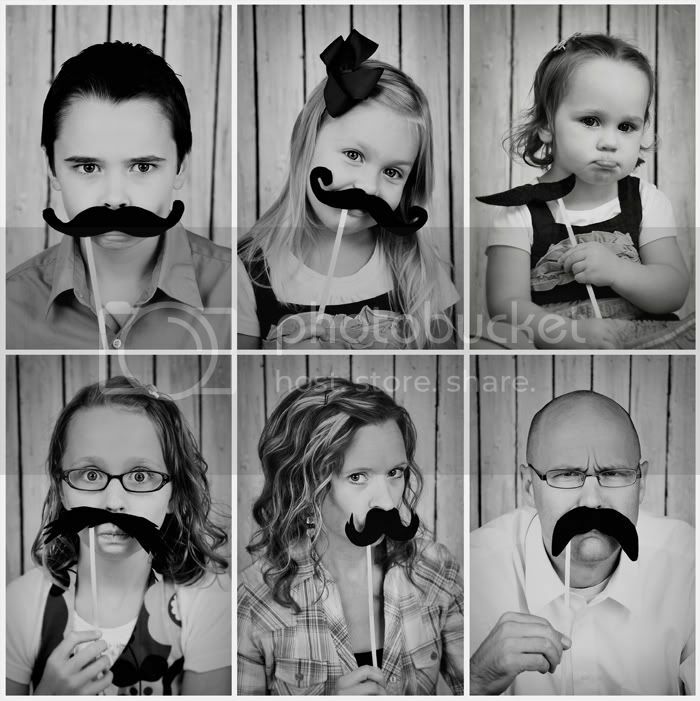 Last year, there was quite a trend of families using props (think mustaches, wigs, sunglasses & more) and people holding chalkboard signs to showcase their greeting. Photo by Natalie, on this awesome blog! Whatever your style is, be sure to follow these tips for great holiday cards and shop now to receive 60% off your Boatman Geller holiday photo cards! Hurry, this ends 9/12/13 so shop all the cards now.